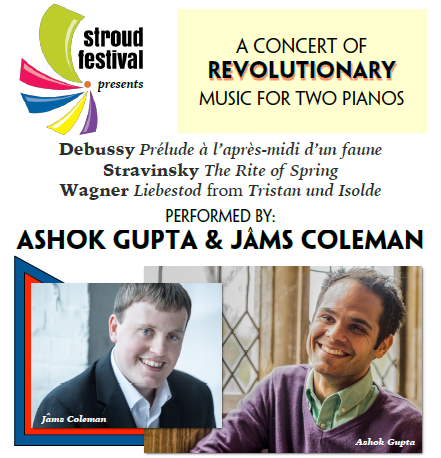 Stroud Festival invited talented pianists Ashok Gupta and Jâms Coleman to put together a programme of music considered at first hearing to be ‘revolutionary’. Stravinsky’s Rite of Spring seemed a natural choice, with its strident sounds and jagged rhythms, as it had caused a riot at its premiere in Paris on 29 May 1913! Debussy brought about a more subtle, but equally revolutionary transformation; his musical language bringing sounds and colours to music hitherto unknown. Wagner could be said to have politicised opera in an almost revolutionary way and his withholding of tonal resolution in Tristan and Isolde is generally considered to mark a turning point in Western tonality. So, Stroud Festival is pleased to present the pianists’ choice of Revolutionary music, all arranged for 2 pianos. Pianist Ashok Gupta studied at Cambridge University, the Royal Birmingham Conservatoire and London’s Guildhall School of Music and Drama and has won major prizes at several international competitions. He has performed in major concert venues in London, Salzburg and Bonn and taken part in several international music festivals including the BBC Proms, the London Music Festival and Oxford Lieder Festival. Alongside his solo performances Ashok has also worked as a continuo player with several leading orchestras, including the Orchestra of the Age of Enlightenment, the BBC Philharmonic, the Irish Chamber Orchestra and the Salzburg Mozarteum Orchestra,and as a répétiteur for some of Europe’s leading opera companies, including Glyndebourne Festival Opera, Dutch National Opera and English National Opera. From Anglesey, North Wales, Jâms Coleman is a soloist, chamber musician and vocal accompanist with performances in the UK,across Europe.and live performances on BBC Radio 3, BBC World Service, BBC 2’s Proms Extra, BBC Radio Cymru and S4C. Jâms read Music at Girton College, Cambridge, where he was also a choral scholar. In 2016 he completed a Masters at the Royal Academy of Music where he then stayed on as a Fellow. His engagements include recitals at the Leeds and Oxford Lieder Festivals and performances at London’s Wigmore Hall. He has also worked as a Musical Director and repetiteur, in 2014 conducting 15 performances of Tchaikovsky’s Eugene Onegin across Wales. In 2018 he was the Artistic Director of a concert series based in St Clement Danes Church in Central London which featured 24 lunchtime concerts and 5 evening concerts.